Hold your Applauses. “Nobel” is not necessarily noble! Kailash Satyarthi seems deeply involved in Western evengelical institutional structures. The Nobel Committee regards it as an important point for a Hindu and a Muslim, an Indian and a Pakistani, to join in a common struggle for education and against extremism. Many other individuals and institutions in the international community have also contributed. It has been calculated that there are 168 million child labourers around the world today. In 2000 the figure was 78 million higher. The world has come closer to the goal of eliminating child labour. The announcement draws on the old theme of Western “parity” between India and Pakistan, and then calls out the purportedly “Hindu” and “Muslim” affiliations of the awardees. Now, going back at least 10 years we did not find the religion of the awardees mentioned in the Nobel Peace Prize announcement. Barack Obama is not called out as a Christian, nor are the affiliations of Marti Ahtisaari, Al Gore, Mohammad Yunus, or any of the other awardees called out. Why the necessity to call out Satyarthi as a Hindu? The long-standing friend and colleague that Barry cites is Simon Steyne. Simon Steyne, according to a report in the Telegraph was a Marxist and “A former militant schoolboy who was once considered so dangerous that his activities were investigated by MI5 is working as a senior official for the Trades Union Congress.” Steyne was vice-chairman of the Schools Action Union, an organisation of militants, “An extreme Maoist group” that Steyne himself described as a “”Marxist-Leninist-Liberal broad front”. In any case, all this Steyne says, is in the past. Would the Nobel Prize Committee call out a Marxist in the West as a “Christian” just as it calls Satyarthi as a “Hindu.” It appears on the lines of “thou protesteth too much”, unusually calling out a religious affiliation of someone who is clearly not properly identified with that label. What exactly are they trying to hide? World Vision is powerful evangelical organisation that makes no secret of its Christian affiliation and agenda. Satyarthi partnering with World Vision brings the classic Breaking India nexus into play—using Indian Leftists to pave the way for evangelism mission in India. World Vision declined to provide additional details of their relationship. “Project Rescue:” that aims to bring trafficked children “to Jesus” is another potential link. Other Christian evangelical websites such as “Rivers of Hope”, referenced Satyarthi’s Bachpan Bachao Andolan rescues, though their exact relationship remained unclear. She also mentioned that “we hadn’t heard much about his work lately. He has gotten a lot of international awards and there are some cynical comments on how these awards are selected.” There were many people working on the issue of child labour and Satyarthi’s work was not particularly notable. She called out Swami Agnivesh, who Satyarthi“trained with” as the one who brought this issue to the fore and was the prime mover. It is unlikely a saffron-clad “Hindu” would be given the Nobel, however. 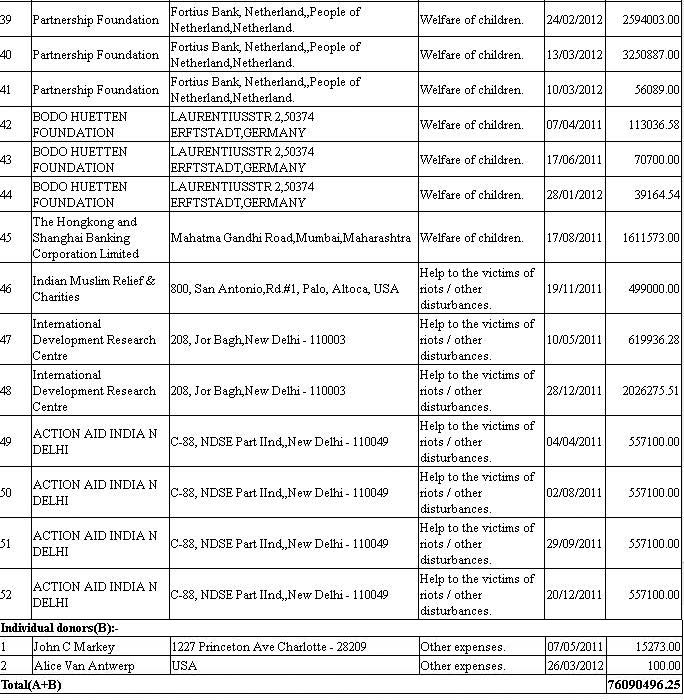 If we take a look at the list of awards that Satyarthi has received, Jaitley’s contention is certainly borne out. – In October 2002, Satyarthi was awarded the Wallenberg Medal from the University of Michigan in recognition of his courageous humanitarian work against the exploitation of child labor. Germany, USA, Spain and Italy are certainly prominent among the countries from which these awards originate. 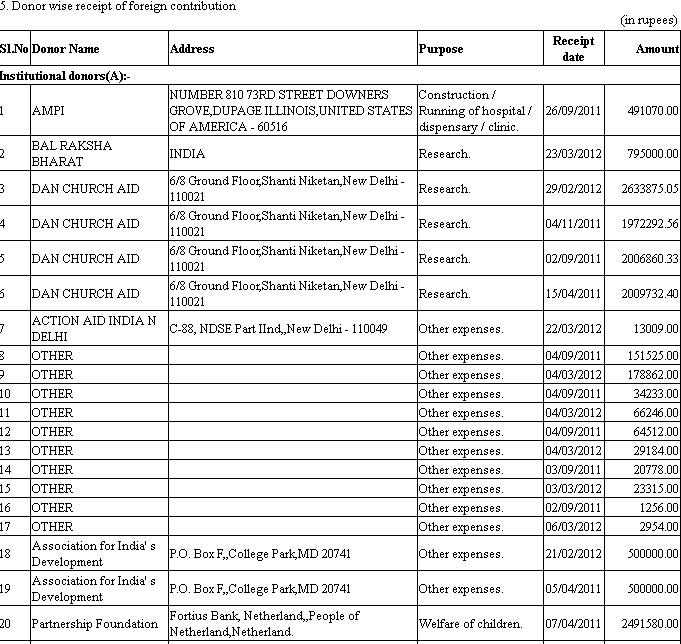 Also the US State Deparment has both awarded Satyarthi and funded his Bachpan Bachao Andolan (BBA) during the Bush era. Finally, Megha Bahree writes in Forbes that her experience with Satyarthi’s Bachpan Bachao Andolan was “Anything But Nobel-Worthy.” She mentions being taken by a BBA representative on a “tour” to show her child labour for a story she was doing. But none of the places she took her had child labor, till he finally asked her to wait and presented a situation with looked fake to her journalistic eyes. As she pointed out “the problem is that the more children you show “rescued”, the more funds you get from foreign donors.” On that account BBA appeared to be doing rather well. 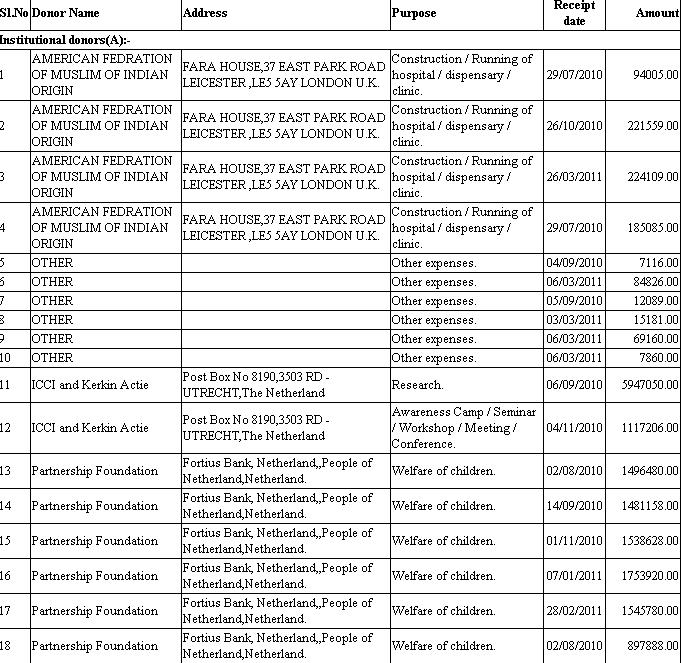 According to Madhu Kishwar, as far back as 12 years ago, he was funded $2 million dollars by US and German foundations. Kailash Satyarthi has no doubt done some good work. At the same time he also appears to be deeply embedded in Western institutional structures and sources of funding for a long time. But he also has his local supporters. He has received an endorsement from Dr. Vaidik, who also claims to know him for long. Dr. Vaidik says that Satyarthi is not self-promotional and keep a simple lifestyle. On the other hand it is difficult to reconcile the slew of largely foreign awards, criticism of peers and charges of inflating numbers with the endorsement of lack of self-promotion. The verdict is still out on Satyarthi and the Nobel on whether he is a hero manufactured by Western institutions for their own interests or a simple, unassuming human rights worker. Given the pattern of funds, the less than stellar endorsement from peers, his Marxist leanings coming with a “Hindu” tag and relationships with evangelical organizations such as World Vision, we should take our newly minted hero with a grain of salt. Disclaimer: Opinions expressed in this article are the author’s personal opinions. Information, facts or opinions shared by the Author do not reflect the views of Niti Central and Niti Central is not responsible or liable for the same. The Author is responsible for accuracy, completeness, suitability and validity of any information in this article. Sankrant Sanu is an entrepreneur, writer and researcher based in Seattle and Gurgaon. His essays were published in the book “Invading the Sacred” that contested Western academic writing on Hinduism and is a popular writer and blogs at sankrant.org. He is a graduate of IIT Kanpur and the University of Texas and holds six technology patents. In 2005, several communist/leftist groups, along with extremist Muslim organizations, Far Right Christian Evangelical Organizations and a set of pseudo secular groups founded by Sri Kumar Poddar, formed the Coalition Against Genocide. They have not only engaged in a persistent and aggressive campaign to destroy the political career of Shri Narendra Modi, but have also attempted to tarnish the image of mainstream Hindu organizations working in the USA, including VHPA, Hindu Students Council, IDRF, Ekal Vidyalaya, Infinity Foundation and the HSS. For the first time, USHA, together with various community organizations, intend to not only expose the workings of these dangerous groups, but also take effective steps to address this menace. They were responsible for rupturing the burgeoning US India relations in the past. We urge the active support of the community so that this initiative led by USHA becomes successful. Time: 7.00 p.m. to 9.00 p.m. Admission is free. Vegetarian dinner will be served. Open to invited guests only. Though this letter was written before 2009 elections, it is equally relevant for state elections and 2014 national election. It applies equally to all political parties except the BJP. If we ever want to get rid of Congress, we must start circulating contents of such articles to a wider audience and start a debate to expose pseudo-secularism. I am not for giving pilgrimage subsidies to Hindus to offset pilgrimage subsidies to Muslims and Christians. I believe, no one should get any help for religious undertakings from the Government. A truly secular government should not be in the business of supporting or enticing followers of a particular religion. I wish the governments would use a fraction of such largess to improve the infrastructure and cleanliness at all major religious places in Bharat, irrespective of the faith they represent. Sub: Your promises to the 71st Conference of the Bible Mission of Andhra Pradesh near Guntur in January 2009 Not a few but many intelligent and true citizens of secular India are stunned by what you promised to the Christians assembled there. 2 Mother Teresa has not only accepted money from criminals, narcotics dealers, smugglers but even wrote to the Governor of a State in the USA to show leniency to a person who was convicted for serious crimes. Her plea was that he donated money to her cause. Suppose the fake stamp printer, Telgi of Rs.35000 cr scam donates money to your Party, would you first accept it and second, tell the public that he is a good man as he donated for a good cause and so, he should be treated leniently ? I urge upon you to remove that photo and to convince yourself, please read the book and also see the BBC TV show which exposed her frauds. 3 You have stated that you attended the conference of the Bible Mission because of your faith in Jesus Christ. This is of course the common naivety of every Hindu because when we accept thousands of people as gods and goddesses and divine, one more could also be accepted, as god’s son, born immaculately to a virgin, Mary. Have you ever asked a Christian or Muslim whether he would in a reciprocal manner, say he has faith in Lord Vishnu or Lord Shiva or Sri Rama? Every Hindu can sincerely and passionately say Easwar Allah tere naam. 4 Have you ever asked a Muslim to say that? I have asked Muslims who were my interlocutors in several public meetings to tell this, just as I said and whether they would repeat it. None of them repeated. I would not question your faith in Christ but I request you to introspect within yourself whether your faith is not misplaced as we do not have a reciprocal affirmation from non-Hindus; that is, Christians and Muslims. 5 You promised to the conference of Christians the continuation of and extension and intensification of state-funding for Christians’ pilgrimage to Jerusalem. We are a ‘secular’ state. There is not a single ‘secular’ state in the world which uses the tax monies of people to fund or subsidise religious pilgrimage of its citizens. Not a single one of the more than 40 Muslim countries in the world funds or subsidises the pilgrimages of its Muslim citizens to Mecca. It is only the ‘secular’ and peculiar state of India that subsidises Muslims’ pilgrimage to Mecca at Rs.35000 per person, increasing annually, costing an amount of over Rs 400 cr in 2008 and increasing every year. It may be of interest to you to know that the Bill to this effect was moved by the so called “secularist” and “socialist” great man, Jawaharlal Nehru himself. 6 As nowhere else in this country or anywhere in the world, the Christian Chief Minister Dr Y S Rajasekhar Reddy of this state has started funding Christians’ pilgrimage to Jerusalem from the coffers of the ‘secular’ state of Andhra Pradesh. This is subversion of our Constitution. Not a single Hindu Minister in his Cabinet had the honor, much less courage to demand that like Muslims and Christians, Hindus forming 85% of the state’s population and contributing 95% of the tax revenues to the government be also subsidised for their pilgrimages to Manasarover,Amaranth, Kasi, Prayaga, Mathura, Ayodhya, Vashno Devi, Simhachalam, Tirupati, Sabarimalai etc. Not a single MLA or MLC of AP has condemned this anti-secular, anti-Hindu measure of the GOAP. 7 Surprisingly, you have promised to the Christians that your party would continue this type of subsidies for religious pilgrimages of Christians. It did not occur to you to say that it is wrong for a ‘secular’ state to do so. Not even that; you did not invoke the principle that a ‘secular’ state should treat all religions alike; you do not say that Hindus pilgrimages would also be subsidised. This makes us to suspect that you and your party, like all the so-called ‘secular’ parties, are engaged in appeasement of minorities in the fond hope of getting their votes. This is reprehensible for a leader and a party which is espousing CHANGE, as the war slogan of the Praja Rajyam Party (PRP). 8 You have also promised to these Christians that the reservations meant for Hindu SCs would be extended to the dalits in Christianity. I am sure you are not ignorant about the claims of Christianity that in it, there is no caste and no untouchability and that all are equal according to the Christian creed. It is by propagandizing this tenet of Christianity that missionaries and evangelists and churches are luring SC Hindus to convert to Christianity. Christianity is hundreds of years old in this country; yet it is practising discrimination against the Hindu SCs who are converted to Christianity. Are you aware that out of over 300 Bishops just only one or two are from the so-called dalit Christians whereas they constitute more than 80% of Christians in India? It is the Brahmin, Reddy, Kamma and such upper caste converts to Christianity that are Bishops. Church organizations, Christian-managed educational and medical institutions do not provide reservations for dalit Christians. Why should secular governments do so? 9 You must be aware that in South Africa, the white European-descent Christian rulers practised untouchability against the black Africans converted to Christianity until the year 1994. White European Christians exterminated 40 million indigenous people in Americas. White Christians traded in slaves and held slaves. The American civil war was fought on the issue of abolition of slavery. Abolition of slavery was proclaimed over 150 years ago, untouchability and segregation against the black Afro- Americans were practiced by the white Christians in the USA till the 1960s. Even today, Afro-American Blacks have their churches separate from the churches of the white European origin Christians. 10 Christianity is thus a great fraud in saying that there is no untouchability or discrimination against low-class, low-caste converts like Hindu SCs or black Africans or Afro-Americans. To such fraudster Christianity, you are promising that reservations meant for Hindu SCs would be extended to converts. It would mean encouragement of Hindu SCs and others to convert to Christianity! Do you please realize this? Is it not an anti-Hindu position? 11 90% of the government servants who have got their jobs in reservation quota by declaring themselves as Hindu SCs are in fact practising Christians-. After retirement Stanley Babu, of South Central Railways, Sri Danam retired IAS officer etc., are examples. One William, an SC Christian is Chairman of the AP State SC/ST Finance Corporation. What do Hindus owe to them, to such fraudster Christianity in Andhra Pradesh that you are promising to help? Should not 85% of voters who are Hindus deem your promise as an anti-Hindu stand? Do you know that Dr B R Ambedkar, whose photo you are exhibiting along with Mother Teresa, told his people not to convert to Christianity as the moment they do so, they cease to be Indians; they get denationlised ? Dr B R Ambedkar also told SCs that they should not convert to Islam either as the brotherhood in that religion is confined to Muslims and the rest are all kafirs, fit to converted or killed. Mahatma Gandhi, whom hundreds of millions of Indians revere, answering a pointed question by missionaries before Independence said, that ‘if I had the power I would, after India gained Independence , send out all the missionaries from the country. He held conversion as the greatest violence, involving utmost fraud. This is what Christian missionaries and Christian organisations in Andhra Pradesh are engaged in and to them you are promising subsidised pilgrimage and extension of reservations for Hindu dalits converted to Christianity. This is a blatant, in fact, a competitive exercise to appease minorities. 12 I appeal to you not to compete with fraudsters, vote gatherers and traitors to Hinduism in making promises to Christians and Muslims in the hope of getting their votes. Have you promised to Hindus what you promise to Christians (and Muslims)? Do you know that the so called minority colleges sell 70% of their seats to Hindus and they don’t give them all to minority students? 13 Finally, I request you to read the enclosed articles and booklets which bear upon the great assault that Hindus and India are being subjected to by the evil quartet of Marxists, Muslims, Missionaries and Macaulayans (i.e., English medium educated persons, who are only in colour and blood Indian, but in culture, belief, tastes, view of India,un-Indian, western, now-a-days, American), resident non-Indians (RNIs) all. 14 You are constantly talking of Change I suggest to you that the Change should be to move away from corruption, anti-Hinduism, diversion of Hindus’ funds and tax monies by a ‘secular’ state to Muslims and to Christians. This nation and our people owe nothing to Muslims or Christians. The former had been the ruthless anti-Hindu rulers in several parts of the country for several centuries, looting and humiliating Hindus. The latter had been collaborators with the British rule, bringing into India unIndian, anti-Hindu faiths and beliefs and religious intolerance. Your party and you which are repeatedly using the phrase change should discard the colonized mindset and cultivate and promote Indian mindset of Sanatana Dharma, that is Hindu and Bharat. has US Government and its various officers, politicians, etc., rushing to the media to denounce and disown the dastardly deed. At the same time when you surf the web you read comments from both sides of the spectrum. While on the surface of it, the act is devoid of human decency and the condemnations seem genuine, reality is very different. If you had to make a choice between the Marines urinating on the enemy corpses and US Soldiers’s treatment of “living” Iraqi prisoners at Abu Gharib, what would you choose? Again if you had to make a choice between the Marines urinating on the enemy corpses and US throwing Napalm bombs on Vietnam and Cambodia, what would you choose? Or, if you had to make a choice between the Marines urinating on the enemy corpses and US decimating half a million Japanese in Hiroshima and Nagasaki what would you choose? And the list goes on and on. So simple truth is that the response of the US Government, politicians and the public as selective and hypocritical. While as a civilized society we may feel uneasy or outraged by this video, fact is that those who fight the war for us are facing and witnessing death and cruelty every day. They are killing and getting killed. It is foolhardy and delusional to expect totally civil behavior in such an environment. While urinating on the corpses is bad, let us not forget that these followers of Islam have no compunction in slitting throats of captives, be they men or women (air hostesses of 9/11 flights), or blowing off planes and bombing crowded markets. And how about Bangladeshi soldiers gouging out the eyes of Bharat (India)’s soldiers and mutilating their bodies? How about Pakistan’s soldiers beheading Bharatiya soldiers and sending back their headless torso? While US Marines’ behavior is an exception, that of Muslim soldiers and terrorists is not; they are uniformly cruel and barbaric. History of Islam bears testimony to that. One can argue that yes, true but we do not have to be like them. The fact is, on a scale of 1 to 10000, US Marines’ act, as much as it jars our senses, is mere 1 and that of barbaric Islamists 10,000. We’re not going to just shoot the sons-of-bi¬tches, we’re going to rip out their living Goddamned guts and use them to grease the treads of our tanks. Three Indian American lawmakers from Maryland have demanded an “immediate apology” from David Williams, a hopeful for the gubernatorial post, for his “offensive remarks” against Kentucky Governor Steve Beshear for participating in Hindu prayers with a dot on his forehead. In a joint statement, Delegates Kumar Barve, Aruna Miller and Sam Arora from Maryland condemned the “offensive remarks” made by Kentucky State Senator and called for an “immediate retraction and apology”. Early this week, Williams had lashed out at Beshear for his participation in a ‘bhoomi poojan’ or ground breaking ceremony of a manufacturing facility. “His words were an insult to all Americans, not just to Hindus. I have served in the Maryland House of Delegates for more than two decades and have never heard an elected official use such reprehensible language toward their fellow citizens,” Barve said. “In the difficult times we face, I cannot fathom why anyone would choose to use such inflammatory language instead of celebrating the economic impact and jobs the plant will create,” Miller said. Yesterday, Williams had sought to clarify his remarks. In a statement, he said, he believes in freedom of religion but believes Governor Beshear has worked to “undermine the Christian faith”. Meanwhile, Washington-based Hindu American Foundation (HAF) has launched a public campaign against Williams seeking his apology. “We need you to act! In one minute you can send a message to Williams, informing him that his words are unacceptable and demanding an apology,” HAF said in a mass e-mail sent to its support base in US. “I request you to make a public apology, not only to those Hindus who you have so blatantly disrespected, but to the countless Americans who value and understand the importance of diversity in our country,” says the draft of the letter provided by HAF. It is the classic case of a kettle calling pot black!! Y.S. Vijayalakshmi, wife of former chief minister Y.S. Rajasekhar Reddy, on Monday approached the AP High Court seeking a CBI probe into the wealth of Telugu Desam president N. Chandrababu Naidu, which she said he had amassed illegally when he was Chief Minister. Vijayalakshmi, the mother of Kadapa MP Y.S. Jagan Mohan Reddy, alleged in her affidavit that Mr Naidu, who came from a lower middle class farmer’s family, had minted money by misusing his power as Chief Minister. Several Telugu Desam leaders had moved the High Court seeking CBI probe into the assets of Mr Jagan Mohan Reddy. The court had clubbed these pleas with a taken-up petition of Congress MLA Dr P. Shankar Rao and ordered a CBI probe into his assets, which is going on. The affidavit ran into 86 pages and Vijayalaks-hmi submitted material papers and documents totalling 2,300 pages in different volumes. Stating that she was prepared to pay exemplary costs if her allegations were disproved, Vijayalakshmi said that Mr Naidu and his top aides had committed offences in violation of various laws including the Prevention of Corruption Act, the Indian Penal Code, the Prevention of Money Laundering Act, Foreign Exchange Mainte-nance Act, the Represen-tation of People Act, the AP Land Grabbing Act and Benami Transaction (Prohibition) Act. As respondents to her plea she named Naidu, his wife Bhuvaneswari, son Lokesh, media baron Ch. Ramoji Rao, Ushodaya Enterprises Private Limi-ted, Heritage Foods (India) Limited. Also named in the petition were Ahobila Rao alias Billy Rao of IMG Bharata, V. Nagaraja Naidu (a distant relative of Naidu), Yelamanchili Satyanarayana Chow-dhary alias Sujana Chow-dhary and Madhucon Sugar and Power Industries Limited owned by TD MP Nama Nageswara Rao.